Summary: The League of Rogues takes what they want—but have they taken on too much? Review: I feel like the cover is the first thing I talk about every time I review a book, but I can't help but obsess over this one! I absolutely love the colors and it hints at the wicked historical romance held inside. And what a great historical romance it was. 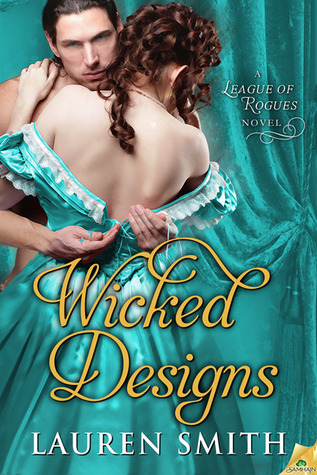 I've never heard of Lauren Smith before, but boy does she know how to write a good historical romance! From the first page, you're thrown into Emily's kidnapping and her putting up quite the fight against the five rogues who take her. Emily is such a feisty character and I love how she's a go-out-and-get-them kind of girl instead of helplessly whining once she got kidnapped. I couldn't wait to see what Emily would do next, or what she decided to do once she started falling for Godric. Godric was quite the male lead for this novel. He had this bad boy, rogue exterior but he had some pretty deep secrets that showed a whole other side of him. Then, when he started to have feelings for Emily, it was so cute how he couldn't stand being away from her. Godric and Emily created the perfect couple for a thrilling romance full of kidnapping, stolen kisses, and a few attempted murders. Not only were the main characters great, but you also go to see a whole lot of the other four members of the League of Rogues. Each of them are so lovable in their own way, and I loved how their individual personalities showed throughout the story. I'm excited to see who the author chooses to write about in the next book of this series. I know I'll definitely be picking it up for yet another enticing historical romance about these devilishly handsome rogues. Enter the tour-wide giveaway! Lauren is giving away of Wicked Designs! What a gorgeous book and the the trailer is fabulous, too. I'm looking forward to reading!